World music gospel at its best; R&B mixed with African stylings. One of Malawi's great artists. This project shows the depth and breadth of this artist's talent. 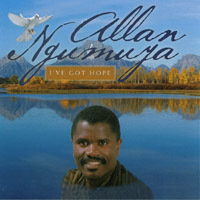 With the upbeat, almost hip-hop "I've got Hope", to the very deep, spiritual melodies, Allan has outdone himself! Ngumuya comes from the poorest country in the world. The average life span is 40 years old and expected to drop due to the Aids epidemic. Allan started a relief organization, Migress Orphanage Care (of which a portion of every CD sale goes to) to feed the young children who literally live on the streets, most are victims of the aids epidemic - having lost their parents to it. Currently this small African nation is also in the midst of the worst food shortage in over 60 years. Allan believes that his music also brings some emotional relief to the people of his country. The songs on this album vary in style from smooth R and B, to a traditional Zulu ingoma dance song, from funky upbeat jazz pieces to songs sung in his native language. With musical guests, such as Tim Tatum's riveting guitars on the title song, I've Got Hope, to the sweet lyrics of the Angelic backup vocals on "We need Love." This album will lift you up and make you sing. It will inspire you and mesmerize you. It is the essence of Malawian gospel music. Malawi is my Peace Corps Home and family :Love the music. choir. Love the voices especially Zulu. My Zulu son Felix would sing to me and dance. I am so proud and want to help. The world will love the music from Malawi as I do. Zikoma. Like the song and my inlaw likes the CD too. I love this albulm and my brother Henry Ndeule loves it very much than me.